I am green – viridian. 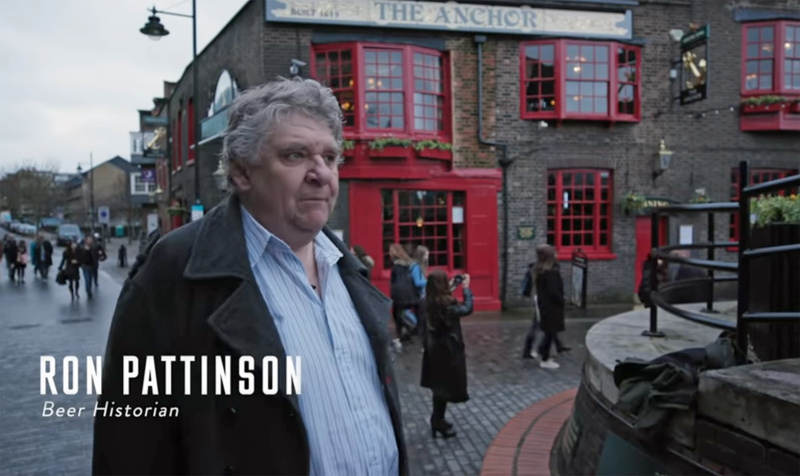 Ron Pattinson has been dropping hints every time I see him about his secret big new project with Goose Island in Chicago, and it’s now been revealed: a reproduction of a London porter from 1840, including authentic heritage barley, properly “blown” brown malt, and blending a long-vatted beer with a much younger version. Who do I have to kill to get hold of a bottle? As it happens, I’ve just finished reading Barrel-Aged Stout and Selling Out Josh Noel’s deservedly award-winning book from last year on the take-over of Goose Island by Anheuser-Busch – do try to get hold of a copy, it’s an excellent, even-handed and sympathetic analysis of what happened and why it happened. You’ll certainly put it down after 345 pages and conclude that AB InBev is indeed interested in nothing more, ultimately, than getting you to buy its product in preference to anybody else’s, and if that meant using its weight, wealth and power to crush the entire global craft beer scene, it wouldn’t care. But that’s what big corporations do: criticising them for wanting to dominate the world is like criticising lions for chasing down and killing wildebeest. It’s the nature of the animal. Run faster, wildebeest. And if AB InBev wants to spend silly sums of money flying my mate Ron, and Derek Prentice, former brewer with Truman’s of Brick Lane, then Young’s, then Fuller’s, and now Wimbledon, out to Chicago to advise on recreating an almost 180-year-old beer, and take enormous pains getting the ingredients and the methodology just right, in the hope that this will greenwash their corporation and get people like me to write admiringly about them, rather than attack them for trying to squeeze smaller rivals out of the market, then they’re partly correct: I’ll still criticise where necessary, but I’m also writing admiringly about the Obadiah Poundage porter project, because I think it’s wonderful to be able to drink this beer from the past, and I don’t believe very many other organisations would have the big wallet, or the commitment, to undertake such a recreation. This is an expensive beer made with unusual ingredients back in March last year, which was then left sitting around occupying valuable real estate in Chicago for a year before being blended with the newer version and put on sale. Most companies’ accountants would have been screaming themselves puce. If not AB InBev, who else would undertake such a journey? Anyway, watch this fascinating 20-minute video about the project, listen to Mike Siegel, research and development boss at Goose Island explain it all, see if you can spot John Hall, founder of Goose Island, popping into shot uncredited occasionally, and then come back here and I’ll discuss a few interesting points that arise, so pay attention and listen out in particular for the mentions of hornbeam, there will be questions afterwards. 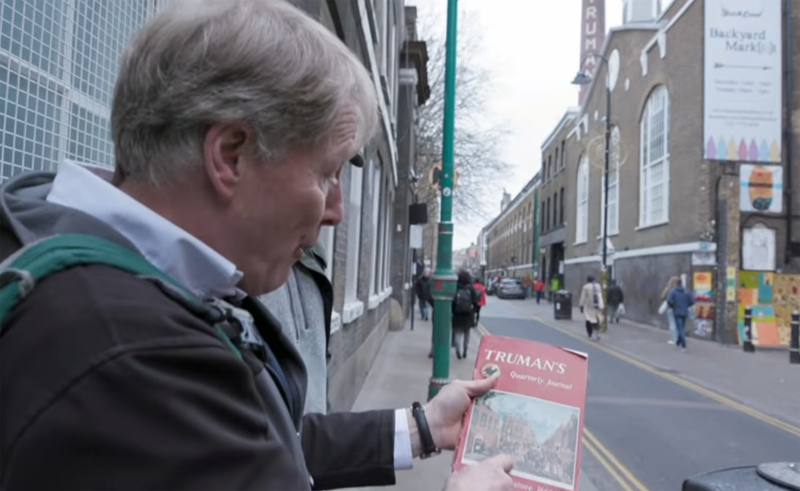 I didn’t expect to find anything to criticise about the history when I watched that. I nodded along as Derek Prentice accurately recounted the role of porters in 18th century London, and as Ron described the change from the all-brown-malt porters of the early 18th century to the more complicated grain bills of later porters, with pale malt, “patent” black malt and “blown” malt dried and browned over faggots of hornbeam wood, and I sat awed as Andrea Stanley of Valley Malt in Massachusetts showed the making of just such a batch of “blown” malt over a fire of hornbeam. And then something strange happened. My subconscious popped up and said: “Hornbeam – are you actually certain about that?” So I checked. For the past 18 months I’ve been writing what is meant to be the definitive history of porter and stout, and I’ve read several hundred books and articles to pull that together. All that information goes down into the subconscious, where, as is the way of the human brain, new connections are formed that the conscious mind is unaware of until something bubbles up from the id. Now, “maltsters made blown malt for porter by drying the grains over blazing hornbeam” is a solid received fact among historians of brewing. I never doubted it. Hough, Briggs and Stevens’s Malting and Brewing Science from 1971 says so: “dried in a fierce heat from a fire of hardwood faggots made from oak, hornbeam, ash or beech” (p166). Steeped in Tradition, a history of the malting industry from 1983 by Jonathan Brown says so: “These kilns were fired by wood, mostly and preferably oak, but beech, hornbeam and ash were also commonly used.” It makes sense: blown malt was a speciality of the maltsters of Ware and other towns in East Hertfordshire, and hornbeam, which burns with a bright, hot flame, is abundant in the woods of East Herts. 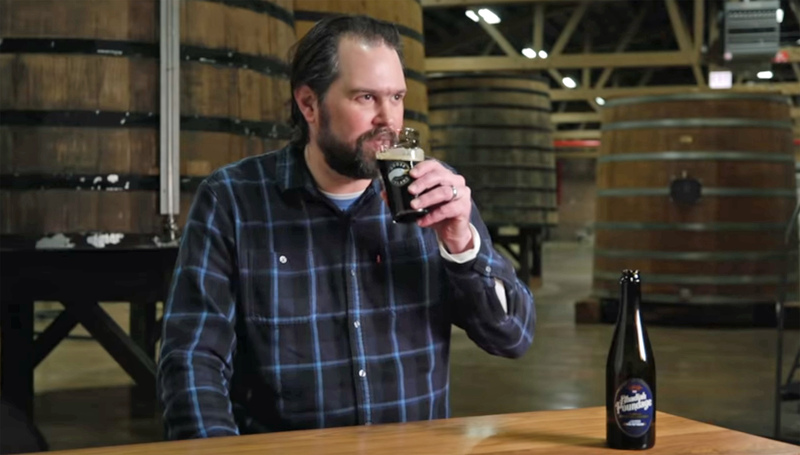 Mike Siegel, r&d manager at Goose Island, tries some Obadiah Poundage at the brewery’s barrel ageing warehouse. Where’s mine? Best not to say anything to dampen the party, really. And let’s not mention that the American hornbeam that Andrea used is a slightly different species to English hornbeam: that would be taking my (deserved) reputation for picky pedanticism too far down the road. Nor let us question why an 1840 porter is named for a man who probably died at least 70 years earlier, the pseudonymous commentator whose letter to the London Chronicle in 1760 about the tax on beer provides historians with so much information about the history of porter. 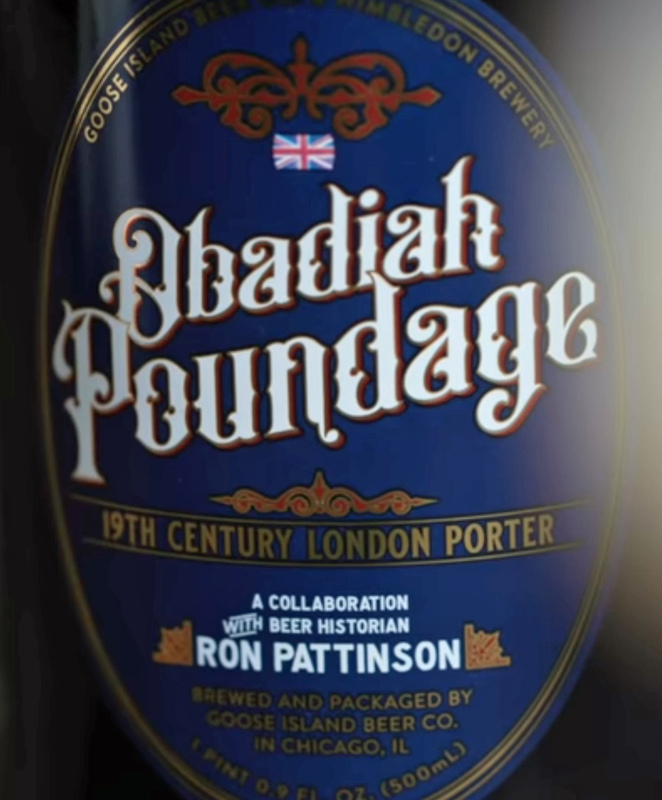 (Someone in the film wonders where the original “Obadiah Poundage” got his name from: “Poundage” is an old word for tax, and one of the many Obadiahs in the Old Testament was a porter “keeping the ward ” [Nehemiah 12:25].) And please, let’s not ask why you have to query every single damned received historical fact because too often what you thought was indisputably true isn’t indisputably true at all. No, there’s a much more important question than all that: where’s my bottle?